May 29, 2018, 7:43 a.m. Following pressure from environmental campaigners, the government looks set to place bans on many single-use plastic products including drinking straws, wet wipes and cotton buds. 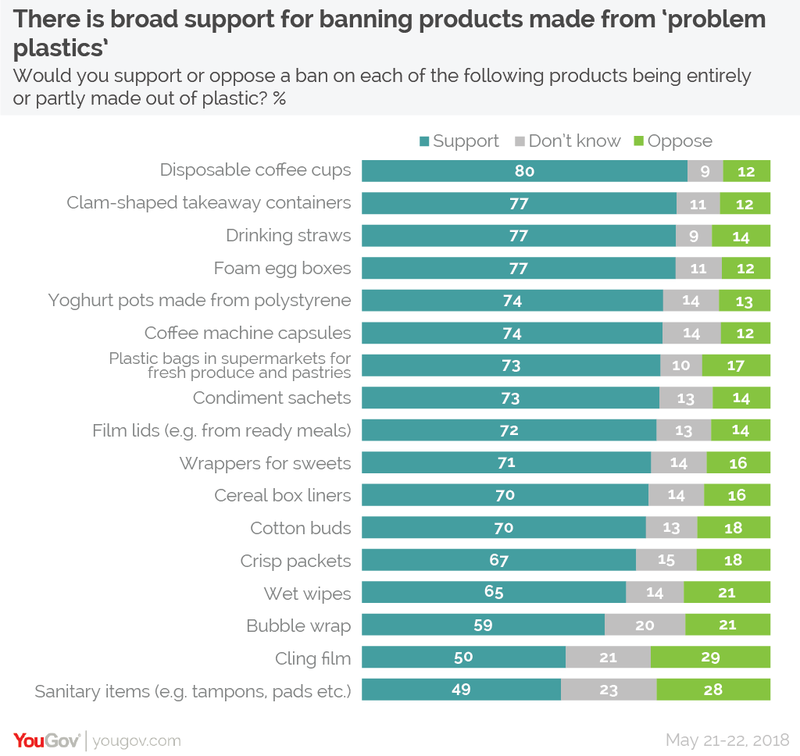 Now new YouGov Omnibus research finds that the public are overwhelmingly supportive of banning these so-called “problem plastics”. By a wide margin, Brits are more likely to support than oppose a ban on each product. Of the 17 products asked about, for 15 of them a majority of the public supports a ban on the items made either entirely or partly out of plastic. Outlawing disposable coffee cups garners the highest level of support, with 80% of people backing a ban on manufacturing such items with plastic, while only 12% opposing it. Clam-shaped takeaway containers drinking straws, and foam egg boxes are in joint second, with 77% of the public supporting them being taken off the shelves. A ban on another of the items on the government blacklist – cotton buds – sees 70% in favour. Sanitary items like tampons and pads are the product that the public are least likely to support banning. Though even here – by 49% to 28% – they back getting rid of them. While men and women are almost equally as likely to support a ban on sanitary items made using plastic (50% of men and 48% of women), many more women oppose it (32% to 23%). Cling film is the only other item with a similar divide between the genders. While the majority of women support banning it (53%, compared to 24% who oppose), the numbers are closer among men (46% support a ban and 35% oppose one). Interestingly, across every single item on the list younger people are less likely to support a ban than older people. However, in most cases this is actually because younger people are more likely to have answered “don’t know” than because they specifically oppose bans. While many news reports say parents are “furious” at government plans to ban wet wipes, YouGov’s research reveals that the majority are, in fact, supportive of such a ban. Even among parents of the youngest children there is still much more support than opposition – 51% of parents with a child aged 4 or younger back a ban, 35% oppose one. Among the nation as a whole those figures are 65% and 21% respectively.